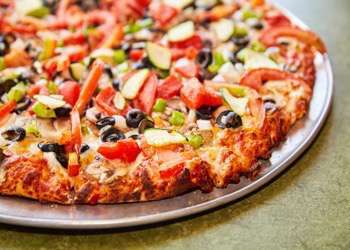 We strive to provide the best pizza, salad, sandwiches, appetizers, and desserts we can by using the highest quality, freshest ingredients. We use the same dough recipe that we developed in 1990. We prepare our sauces from scratch in every restaurant. 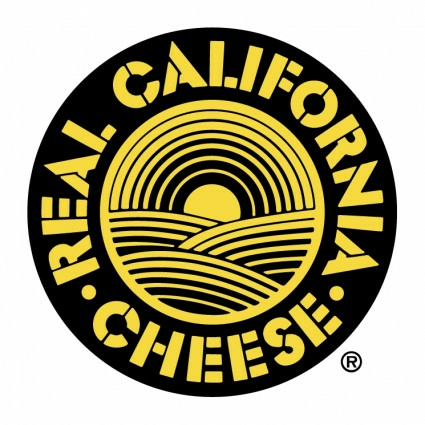 We grate thousands of pounds California Cheese every week, and have a full-time crew dedicated to preparing vegetables and maintaining our Salad Bars. Our homemade pizza cookie is an old family secret recipe, and we make the dough ourselves. Maybe we haven’t changed much over the past few years, but we think you cannot beat consistency. Mediocre imitators abound, but there is only one Toppers Pizza Place. Salami, Pepperoni, Italian Sausage, Ground Beef, Mushrooms, Olives, Onions, and if you request: Bell Peppers & Anchovies. Mushrooms, Olives, Onions, Bell Peppers, Zucchini, Roasted Red Peppers and Fresh Roma Tomatoes. 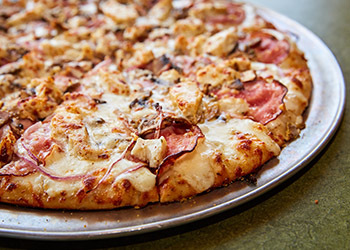 Ranch Dijon Sauce, topped with Canadian Style Bacon, Mushrooms, Red Onions, Chicken & Grated Parmesan. 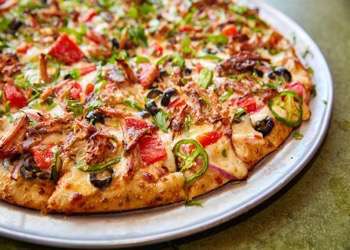 Chipotle Sauce topped with Carnitas, Roasted Red Peppers, Olives, Red Onions, Cilantro and if you request: Fresh or Nacho Jalapenos. 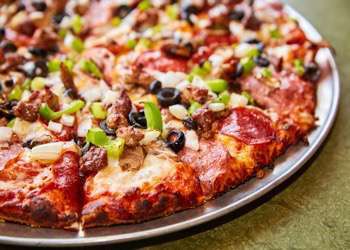 Creamy Garlic Sauce topped with Pepperoni, Hot Sliced Italian Sausage, Italian Sausage, Mushrooms, Red Onions, Fresh Roasted Grape Tomatoes & if you request chopped or roasted garlic. Creamy Garlic Sauce topped with Chicken, Roasted Red Peppers, Mushrooms, Red Onions & grated Parmesan & if you request chopped or roasted garlic. 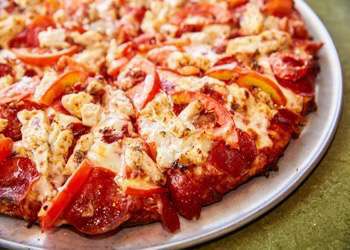 Our Original Pizza Sauce topped with a delicious combination of Pepperoni, Bacon Pieces, Chicken and Fresh Roma Tomatoes. 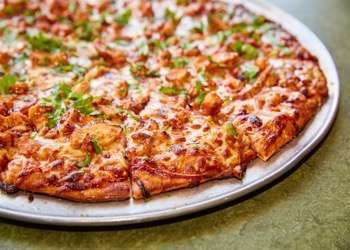 A sweet & slightly spicy Barbecue Sauce, topped with Chicken, Red Onions, & Fresh Cilantro. 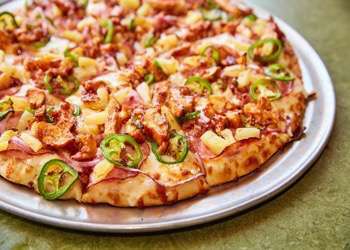 Creamy Garlic Sauce, Canadian Style Bacon, Chicken in BBQ Sauce, Bacon Pieces, Red Onions, Pineapples & Jalapenos. 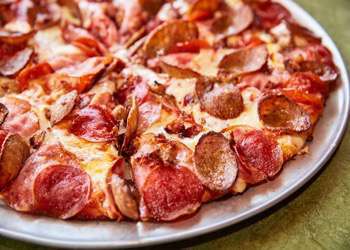 Our Original Pizza Sauce, Canadian Style Bacon, Salami, Pepperoni, Hot Sliced Sausage, Bacon Pieces & Italian Sausage. 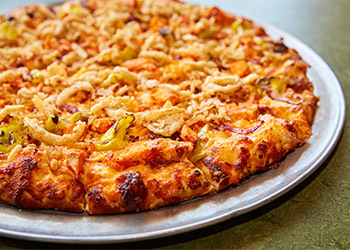 Creamy Garlic Sauce, Cheddar and Provolone Cheese, Chicken in Buffalo Sauce, Red Onion, Pepperoncini Peppers, Bacon Pieces & French Fried Onions. 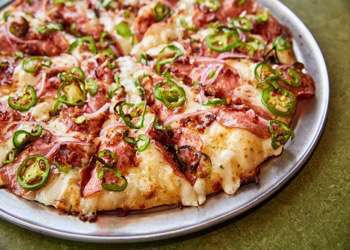 Creamy Garlic Sauce, Salami, Red Onion, Fresh Jalapenos, Bacon Pieces & a Honey Drizzle. Choose your favorite sauce and customize your pizza. If not specified, Original Pizza Sauce will be used. Only one type of sauce can be chosen for each pizza. All of Our Sandwiches Include a Bag of Miss Vickie’s Kettle Chips. Salami, Pepperoni & Ham with Swiss & American cheese. Served with Italian dressing, mayonnaise, lettuce & tomato. Pizza Sauce, Slices of Hot Italian Sausage, Onions, Bell Peppers, with Melted Mozzarella cheese. Thinly sliced Ham & Swiss cheese. Served with mayonnaise, lettuce & tomato. Mushroom, Zucchini, Black Olives and Roasted Red Peppers, with Swiss & Parmesan Cheese.Served with mayonnaise, lettuce, tomato & Dijon Sauce on the side. Sliced Turkey Breast, crisp Bacon and Swiss cheese. Served with mayonnaise, lettuce & tomato. Sliced Meatballs in a zesty Italian sauce, with melted Mozzarella cheese. Thinly sliced lean Pastrami & Swiss cheese. Served with Italian dressing, mayonnaise, lettuce & tomato. Tender Pork in our Spicy Barbecue sauce, with melted Mozzarella cheese. Four Cheese Ravioli stuffed with Ricotta, Parmesan and Fontina Cheeses, smothered in Mozzarella and oven-baked to perfection. 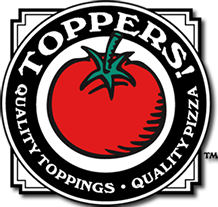 Choose from Toppers homemade Meat Sauce or Marinara Sauce. Any two toppings included. The freshest green salad you can make! 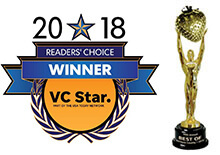 Readers Choice Full County Winner for Best Salad. We hand chop our vegetables and make all of our dressings in-house. Toppers homemade Jalapeno Poppers freshly baked (not fried) to order. Fresh jalapeno peppers stuffed with a filling of cheeses, dried cranberries and raspberry chipotle sauce, then topped with crisp bacon pieces. Our own homemade pan-baked cookie freshly baked to order and served hot with a scoop of vanilla ice cream. With 2 toppings of your choice. Extra toppings at additional charge. A Lunch Size Pizza with 2 toppings and a Small Salad Bar. 3 Ravioli with any 2 toppings, Small Salad, and a Garlic Breadstick. Any Sandwich and a Small Salad Bar. We feature a wide variety of both popular and craft beers. We rotate them regularly and try to feature local beers as much as possible.